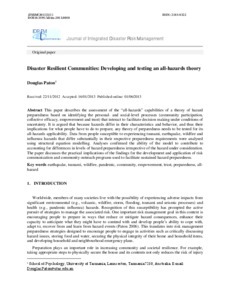 This paper describes the assessment of the "all-hazards" capabilities of a theory of hazard preparedness based on identifying the personal- and social-level processes (community participation, collective efficacy, empowerment and trust) that interact to facilitate decision making under conditions of uncertainty. It is argued that because hazards differ in their characteristics and behavior, and thus their implications for what people have to do to prepare, any theory of preparedness needs to be tested for its all-hazards applicability. Data from people susceptible to experiencing tsunami, earthquake, wildfire and influenza hazards that differ substantially in their respective preparedness requirements were analysed using structural equation modelling. Analyses confirmed the ability of the model to contribute to accounting for differences in levels of hazard preparedness irrespective of the hazard under consideration. The paper discusses the practical implications of the findings for the development and application of risk communication and community outreach programs used to facilitate sustained hazard preparedness.